The group exhibition Space Age, which closed yesterday at Galerie Thaddaeus Ropac in Paris-Pantin, took up all four of the gallery’s spacious halls to examine historical and commissioned works by twenty contemporary artists, drawing on the astrological, the exploratory, and the untapped potential of outer space. The artworks on view explored one of humanity’s most archaic collective dreams: the conquest of the skies and the immersion in the cosmos. Several events such as the launch of Russian Sputnik spacecraft, the first expedition of a woman in space, the Hollywood movie Interstellar, or the recent Pluto flyby have created and later renewed society’s fascination with outer space adventures, technology and future social alternatives. Inspired by rockets and spaceships, artists like Robert Rauschenberg, James Rosenquist, Richard Artschwager and Anselm Kiefer equally reflect their vivid, multi-layered interest in the skies, and introduce these powerful imaginaries into their work. 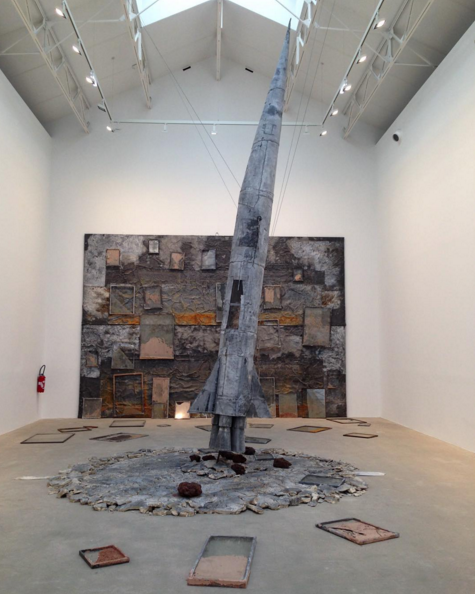 Das Grab in den Lüften (A Tomb In The Sky), for instance, based on a poem by Paul Celan, is a major installation by Anselm Kiefer, which is composed of a tall rocket contrasting with a surrounding large canvas and broken frames. The juxtaposition of process and devolution evokes the sacrifice of human life in order to achieve certain ideals. 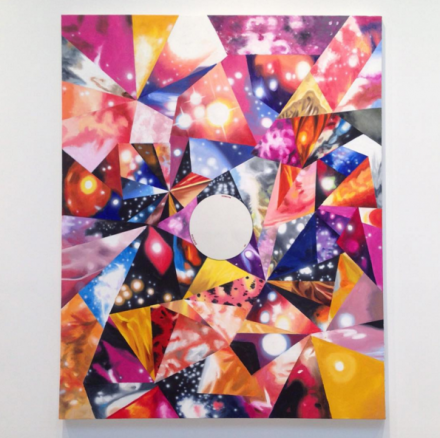 Conversely, James Rosenquist, who had a continuous eye on the scientific phenomena around the US space program showed two new paintings that represent a fragmented cosmic view of space, in his very iconic Pop Art style. Robert Rauschenberg, was also on hand, with a work from his famous Glut series, Nagshead Summer Glut Sketch, mounted a wall sculpture built with airplane parts. Other works reflect on more extended and social constructs fueled by the space race, from new conceptions of the body to utopian promises. Lee Bul’s installation, for example, proposed and questioned the exploration of science fiction and cybernetics through gender politics, the notion of collective imagination, and the body as monument, while Dan Flavin’s Monument for V. Tatlin resonated with undertones techno-utopia and references to the legendary utopian tower of Russian artist Vladimir Tatlin that would have made possible a new experience of space. Also pulling from the influence of the Russian space programs, Ilya and Emilia Kabakov’s installation Fallen Angel referred to the Greek myth of Icarus, working around a desire to be elevated in the skies. Yet the show also addressed the downsides of the space program, and some of its darkest moments. 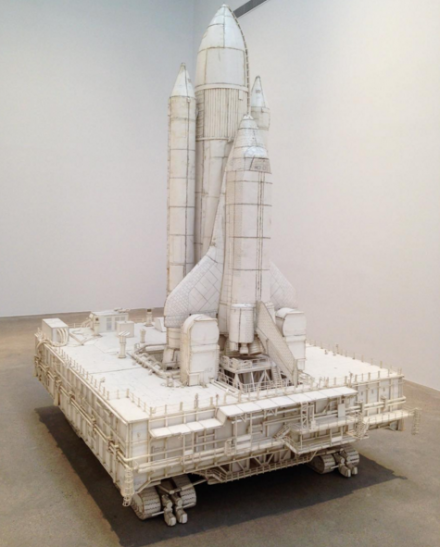 Crawler, by Tom Sachs, reflect his fascination with NASA machinery, a direct reference to the crash of the space shuttle Challenger in 1986 and a suggestion perhaps that the cutting edge technology of today heralds the disasters of tomorrow. 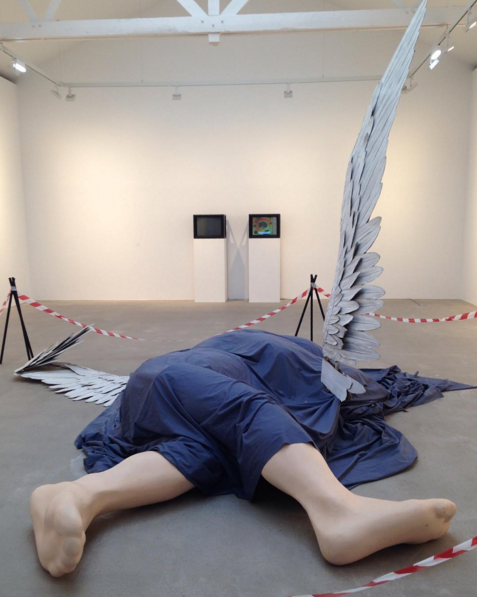 In another indirect exploration of space, Cory Arcangel’s MIG29 Soviet Fighter Plane and Clouds showed a video projection of hacked popular Nintento games where all competitive elements are deleted and only digitally generated images of the sky and its main protagonists remained alongside the iconic Nintendo clouds and the Soviet Fighter Plane. Spage Age also proposed more collective views of specific works by Robert Longo, Jack Pierson, Not Vital, and Sturtevant, among others, with installations and paintings reflecting the artists’ relationship to vehicles of utopian dreams that take the viewer of today to yet unexplored territories. 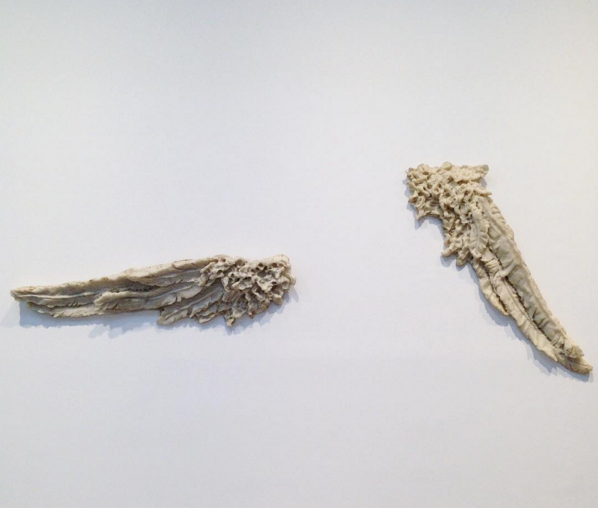 This entry was posted on Thursday, December 24th, 2015 at 6:31 pm	and is filed under Art News, Featured Post, Show. You can follow any responses to this entry through the RSS 2.0 feed. You can leave a response, or trackback from your own site. Wow, I’m especially drawn to the Tom Sachs and the Patrick Neu. Wish I’d been in Paris for this show. Thanks for sharing!